What do so many of our childhood favorites have in common? Color! 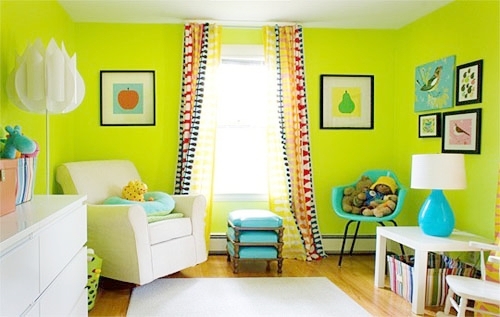 Bright, bold, saturated color. Before we could read, we loved looking at the pictures in Chicka Chicka Boom Boom (Bill Martin Jr, John Archambault and Lois Ehlert) Mouse Paint (Ellen Stoll Walsh) or anything by Marcus Pfister or Eric Carle. The colors in these favorites inspired imagination, they meant fantasy, and we were surrounded by them. So lets do just that, lets surround our children with beautiful colors, from painted walls and bright patterns to juicy-colored furniture to ocean-toned bedding. A naturally lit room is perfect for a darker, dramatic shade, while a room with less light is made more inviting with a bright, saturated color. If that's not your cup of tea, try a neutral palette as a backdrop for bold decor. Finally, pieces with classic lines complement a, perhaps, non-classic color. Click here to go bold in your home.